The very best security safes are independently tested by organizations such as ESSA/ECB-S to determine the amount of burglar resistance they provide. To ensure fair play, tests are carried out according to international standards such as the European EN 1143-1 Eurograde system. But how exactly do these tests measure burglar resistance? How long it takes to gain partial and complete access to the safe. The type of tools used to penetrate the safe. A testing team consisting of a team leader, test operatives and a time keeper perform the test. Technical documentation and specifications for the safe are supplied by the manufacturer. This allows the test team to decide how best to attack the safe by revealing potentially vulnerable points. It also helps them decide which tools might be the most effective. In addition, it ensures the safe has been installed in the testing laboratory according to the manufacturer’s precise instructions. Safe testers and their tools. The test begins the moment the first tool makes contact with the safe. 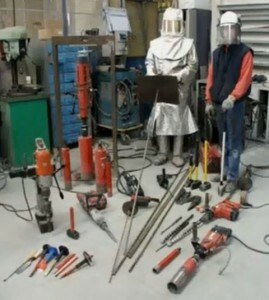 Under the EN 1143-1 standard, tools are classified into five groups, A, B, C, D and S. Each category of tool has what is known as a “basic value” and a “tool coefficient.” These numbers are assigned to tools based on a number of factors, including how effective the tool is, how complicated it is to use, how difficult it is to obtain and transport, and whether its use would result in attracting attention because of noise, fumes, sparks etc. Category A: Short hammers, short chisels, screwdrivers, short crowbars, handsaws. Category B: Sledgehammers, long chisels, long crowbars, certain types of power drill and saw. Category C: More powerful power tools, jack hammers, basic diamond disc cutters, thermal cutters. Category D: More powerful thermal cutters, thermic lance, arc cutters. Generally speaking, the test team will attempt to use tools with a lower coefficient as much as possible as this gives a far more realistic “real world” assessment of the safe’s capabilities. 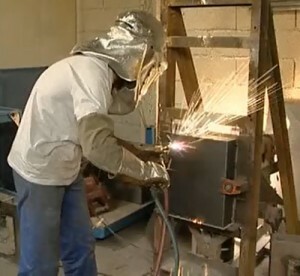 Using an oxy acetylene torch. The test team’s first goal is to achieve partial access to the safe. This means creating an opening through the door or body that would be large enough to remove some of the safe’s contents. Three standard sized test blocks of various shapes are used to decide whether the hole made is large enough. These blocks are each 150mm in length. If any of these fit through the opening, the team has managed to gain partial access to the safe. The tools used, as well as the amount of time each tool is used for, is recorded. Next, the team must attempt to gain complete access to the safe. This means they either manage to open the door wide enough to potentially access all of the safe’s contents or they create an opening in the body or door large enough to remove all the contents. Again, standard sized test blocks are used to decide if the opening is of the required size. In this case the blocks are 400mm in length and are roughly twice the size of those used to test for partial access. The tools required and the amount of time each tool is used for is recorded. For built-in safes such as wall safes and underfloor safes, removing the safe from the wall or floor encasing it counts as complete access. Note that the locks on a safe cannot be subjected to any attack in the course of the EN 1143-1 test. 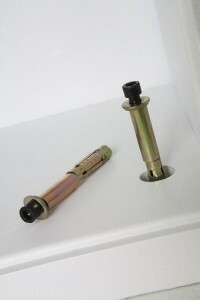 Instead, locks fitted to Eurograde safes are tested under the EN 1300 test standard. The resistance value of a security safe is calculated based upon the total time taken to achieve partial and complete access and the type of tools used during the test. The times, tool coefficients and tool basic values are entered into a simple formula and the final resistance value calculated. Resistance values are measured in Resistance Units or RU’s. A single RU is equivalent to one minute of resistance against a very basic tool such as a chisel or short saw. Anchoring system from a Phoenix safe. Freestanding safes of under 1,000kg must be anchored to a floor or wall using fixing bolts. The EN 1143-1 standard tests the strength of such bolts and anchoring systems. The testing team use special loading equipment for this test, and basically attempt to rip the safe from its anchor. The amount of force applied depends on the level of security the safe claims to provide. High security safes must endure up to twice the amount of lifting force as lower security safes. Under the EN 1143-1 standard, safes can also be tested for their ability to resist certain specialized attacks. Safes with an EX designation have been tested for their ability to resist explosives. The CD designation is reserved for strongrooms and refers to their ability to resist attack by diamond core drilling equipment. The following table shows the resistance grades and anchoring strengths required by safes in the Eurograde system. As you can see, calculating the burglar resistance of a safe is quite scientific and rigorous. Testing is performed under strict conditions and to very specific standards. This illustrates the importance of choosing a security safe that has been tested to international standards by a reputable testing house. 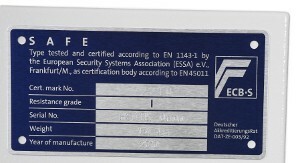 More information on the EN 1143-1 system can be found in our previous article about Eurograde Safes. Safe testing images in this article are from the Burglary Test video on Chubbsafes’ YouTube channel. The Chubbsafes’ YouTube channel features many more great videos, including a fire test demonstration.